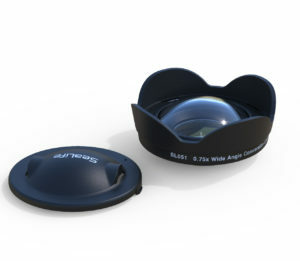 The 0.75x Wide Angle Conversion Lens compensates for the water’s magnification effect (i.e. refractive index), increasing underwater field-of-view by 33% allowing underwater photographers to get closer to the subject and still fit everything into the frame. 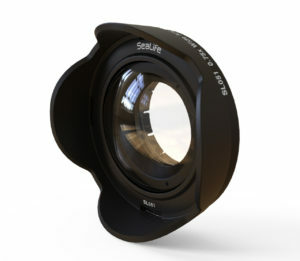 The lens design uses high grade 2-element optical glass components that deliver crisp edge-to-edge sharpness. All internal optical elements are fully, multi-coated to prevent glare and maximize light transmission. 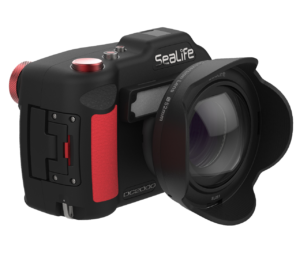 It is waterproof to 164ft/50m and fits all SeaLife DC-series cameras and other cameras with a 52mm thread mount, and comes with a 52mm DC adapter ring (SL977). · DC2000: Increases underwater field-of-view from 46° to 61°. · DC1400: Increases underwater field-of-view from 61° to 81°. · High grade 2-element optical glass components. · Fully, multi-coated optical elements to prevent glare and maximize light transmission. · Waterproof to 50m (with SeaLife DC2000). · Contents of box: Wide Angle Dome lens with 52mm thread mount, 52mm DC adapter ring, neoprene covers for back & front of lens and a micro fiber cleaning cloth. SeaLife DC2000 camera: Can be used in macro, super macro, and auto focus with 0.5x Wide Angle Dome Lens. Lens will not work in infinity focus. SeaLife DC500 to DC1400 cameras: Must be set to macro focus with 0.5x Wide Angle Dome Lens.